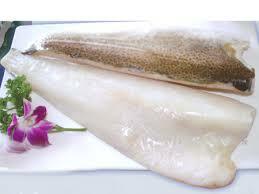 Cod - Our best selling fish, it is renowned for its superb quality with large white flaky flesh. Preheat the oven to 220C/Gas 7. Put the peppers, courgettes and onion in a large baking tray and drizzle them with the oil. Season with a little salt and plenty of ground black pepper and toss everything together until the vegetables are lightly coated with oil. Roast for 20 minutes until softened and lightly charred. Pat the fish dry on kitchen paper and check for any bones. Remove any that you see with tweezers. Season the fish with freshly ground black pepper and wrap each fillet loosely with a slice of ham. Take the baking tray out of the oven and make gaps in the layer of vegetables to make space for the pieces of fish. Place the fish on the tray. Mix the breadcrumbs with the cheese and parsley and scatter over the fish and vegetables. Put the tray back in the oven for another 12–15 minutes or until the fish is cooked, the ham has crisped and the breadcrumbs are lightly browned. 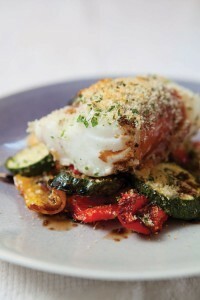 Serve hot, drizzled with a little balsamic vinegar. To make the sauce: Melt half the butter in a pan, add the shallots and cook until soft, but not browned. Pour in the wine and let it bubble and reduce by about half. Add the fish stock and let it reduce to about 150ml. Blitz with a stick blender, then whisk in the rest of the butter and the cream, and some seasoning. Set aside. Cook the leeks in half the butter for about 15-20 minutes until softened, then add the cream and cook for another 4-5 minutes. Season and set aside in a dish. Wipe the pan, reheat and add the rest of the butter and mushrooms and cook for a few minutes. Wilt the spinach in a pan or in the microwave. Heat the frying pan, add the oil and when hot, put in the cod and cook for 5-6 minutes over a fairly high heat until browned on the underside and just cooked through. Reheat the sauce. Spoon the creamed leeks on to 4 hot plates. Add the spinach and some mushrooms. 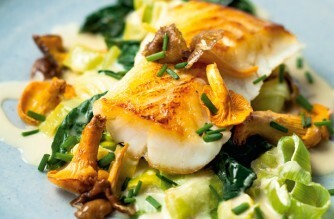 Put the cod on top, then garnish with a few more mushrooms. Spoon the hot sauce over and sprinkle with chopped chives.